WebYaST allows to configure your machine remotely using just a Web browser. Just like your DSL router can be configured via a web interface, WebYaST powers your SUSE based virtual appliance with a management application. Look at the project details to learn more about the initial functionality. Speedup WebYaST by data caching. Install WebYaST on your locale machine. 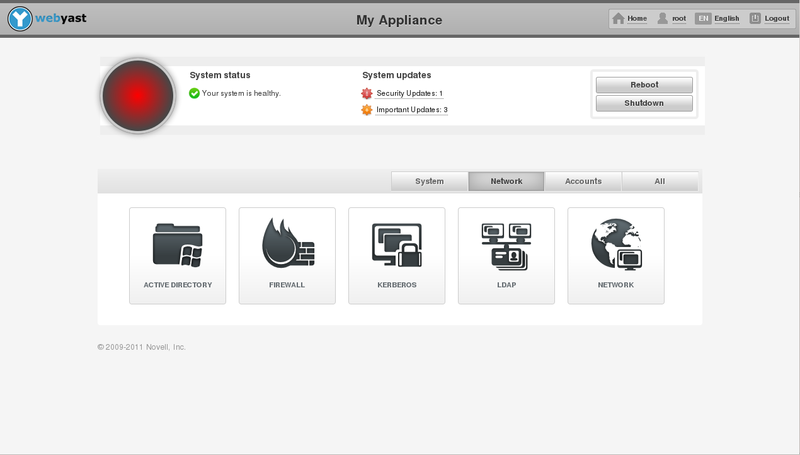 Using WebYaST in an appliance. Subscribe to the yast-devel mailing list (archives). Join the yast IRC channel. There is an extensive information how to help with development on our development page. This page was last modified on 23 February 2011, at 13:06. This page has been accessed 87,603 times.